"Chopped deli ham and strips of cheese create layers of flavor in this baked egg casserole." Grease a 2 quart baking dish. Layer the bread, ham, 2 cups cheese and 2 tablespoons chives in the dish. In a medium bowl, whisk together the eggs, milk, 1/4 teaspoon salt and 1/2 teaspoon pepper. Pour into the dish and top with the tomato slices in an even layer. Bake the eggs until nearly set, about 30 minutes. Sprinkle the remaining 1/2 cup of cheese and 1 tablespoon chives on top and bake until golden. 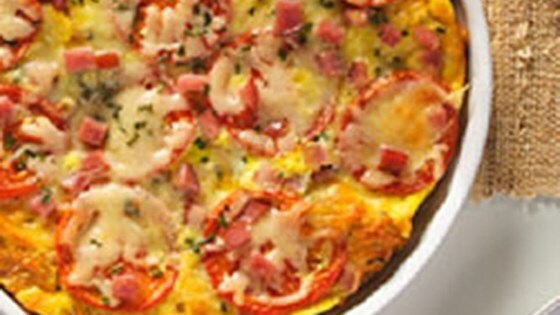 See how to make a simple breakfast casserole with eggs, ham, cheese, and veggies. This is very good, and simple recipe. I made no changes to it, and will make it again, exactly the same. Great! Quick & easy. We usually have the main ingrediants on hand & add or swap out others as needed. 5 stars, it's so easy even I can make it! This recipe puts in mind the correct proportions of bread, eggs and milk. So then adding your own ideas comes easy. I added spinach and onion, used garlic powder in the egg mixture and used half and half instead of milk. I didn’t use the bread. It was flavorful and turned out good. It took 50 minutes to bake.